Virtually ahead of every regatta, the need for volunteers is ventilated. But to avoid repeating this year’s last-minute scrabble to make up an apparent shortfall, several measures are being planned. 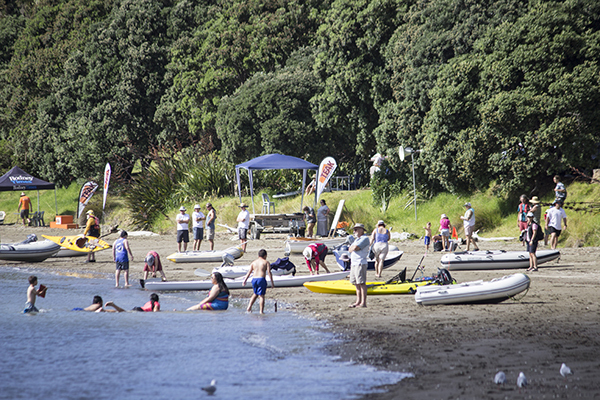 The first is to augment the ‘This Saturday’s Mahurangi Regatta needs volunteers…’ sign at Mahurangi West with another month-earlier-placed sign of similar sentiment but referring to the timing as Auckland Anniversary weekend Saturday. Although nothing could be further from the truth, there is a risk for the regatta organisers that more recent residents may perceive that volunteers are neither needed nor welcome. Until 2012, a list of 48 volunteer roles was published, and updated as offers were received. It is timely for that list to be reinstated, and made interactive to boot. A prodigious number are needed, if the flogging of willing horses is to be avoided. Like tree planting, the fun can wear off after a couple of hours. This year the sponsor was left to almost singlehandedly pack up at Sullivans Bay, at the end of the afternoon. The help of a just a couple of people for less than an hour, at that hour, would be a wonderful way for Mahurangi to express its appreciation to a not-enormous company that makes the regatta its main charity, to the tune of $12&hairsp;000 annually, in cash and in kind. But while Mahurangi West might have gone into the regatta a little flat-footed this year, Scotts Landing saw a sea change, with merraMahurangi East Residents and Ratepayers Association volunteering for most of the roles involved with the paddock parking, the free regatta shuttlebus, and the Scott Homestead gatekeeping. The experience was so positive that most of those roles are now spoken for 12 months in advance. This was due in part to the lavish gratitude expressed by the shuttlebus patrons, but also to astute merra management in ensuring that volunteers did humane shifts. A far cry from 2018, when mismanagement saw one shift that might have been illegal, had the driver been paid. Since Teak Construction came to the rescue of the 2016 Mahurangi Regatta, every regatta thereafter has richly benefited from the amazingly benign three-plus-three-plus-three-year sponsorship partnership. Just one typically nurturing move was to host regatta crew briefs and debriefs. Usually at the Mahurangi West Hall, the community restoration of which was project managed gratis by managing director Stuart Charlton, this year’s debrief is barbecue-format, at his residence, on Mahurangi West Road, this Friday. 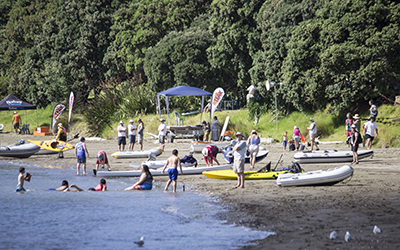 The invitation is warmly extended to volunteers past and prospective—the Mahurangi Regatta shoreside events crew might be valiant, but never vainglorious.